It followed weeks of high-level horse-trading since PREMIUM TIMES unraveled a certificate forgery scandal involving the minister. The minister’s resignation was confirmed Friday evening through a statement by special adviser to the president on media, Femi Adesina. Mr Adesina announced President Muhammadu Buhari’s acceptance of the resignation tendered by the minister. He also provided full text of the minister’s resignation letter. On July 7, this newspaper exclusively reported how the finance minister skipped mandatory national youth service and forged an exemption certificate to cover it up. PREMIUM TIMES has in series of reports between March and April painted a picture of unholy alliance between the minister and federal lawmakers, who used the discrepancy to blackmail Mrs Adeosun into illegally financing the legislature. Despite outrage and condemnation from Nigerians, Mrs Adeosun maintained studied silence throughout. The minister was reportedly assured by some powerful forces that nothing was going to happen to her. But sources at the presidency said the NYSC director general, Suleiman Kazaure, a brigadier general, was unbending to pressures, insisting that there was nothing he and his officials could do on the matter. Impeccable sources told PREMIUM TIMES the minister was barred from the weekly Federal Executive Council (FEC) and told to submit her resignation to the Chief of Staff to the president, Abba Kyari. The verbal instruction, which was relayed to her by Mr Kyari on behalf of the president was said to have rattled Mrs Adeosun who went home downcast from the villa. The option of resignation was long settled on in government circles as a way of giving Mrs Adeosun an opportunity to save what remains of her integrity. A leader of the ruling All Progressives Congress (APC), Bola Tinubu, reportedly made the case to President Buhari to ask the minister to resign. This was, however, not done before the president left for London on vacation in July. Since the communication of the presidential decision to her on Friday, Mrs Adeosun, who was overcoming the initial hit from the issue, reactivated lobby to reverse the order. Governors sympathetic to her cause made spirited attempts to change her fate on Wednesday, but met brick wall. Seeing that her fate was sealed, Mrs Adeosun reluctantly called for a meeting of senior finance ministry officials on Thursday. A senior ministry official who requested that his name should not be revealed, as he was not authorised to speak on the issue, said the minister turned in her resignation letter the same day. The official said the minister received instruction to submit her resignation letter the previous day at the end of the weekly Executive Council of the Federation (FEC). At the brief meeting Thursday afternoon, Mrs Adeosun directed them to commence the process of tidying the books and prepare the handing over notes. Two senior finance ministry officials who spoke with our reporter on condition of anonymity because they were not authorised to speak to the press said there was directive to all the departments to immediately begin work on the hand over notes. “There is fire on the mountain. We have been asked to abandon all we were doing and quickly put together reports in preparation of hand over notes,” one assistant director who attended the meeting with the minister on Thursday told our reporter. Another top official familiar with the issues corroborated the information on Friday, adding that attention of key staff was now focused on turning in reports from their units and departments to meet the deadline the minister gave. 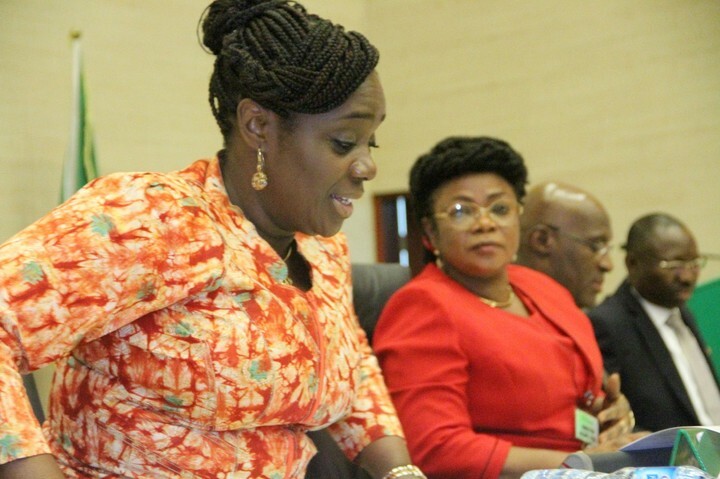 The official said the directive to officials to delay the formal announcement of Mrs Adeosun’s departure from the Executive Council of the Federation was given by the presidency to allow the minister sufficient time to complete her handing over note. After spending the entire day in the office working to clean up her table and pick her personal belongings, the minister handed over to the ministry’s permanent secretary, Mahmoud Dutse, Friday evening. Having graduated at 22, the Nigerian law made obligatory for Mrs Adeosun to submit herself for mobilisation to participate in the one-year mandatory national service, for her to qualify for any job in Nigeria. Days later, the NYSC requested for time to investigate and carry out verification of the minister’s certificate. The result of that verification was never made public but played a key role in Mrs Adeosun’s exit.